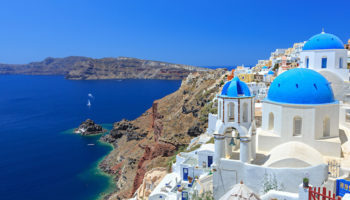 Breathtaking views from soaring cliffs, whitewashed churches topped with bright blue domes and archeological treasures from a lost civilization are just some of the reasons that the island of Santorini is routinely included in the lists of the best places to visit in the world. 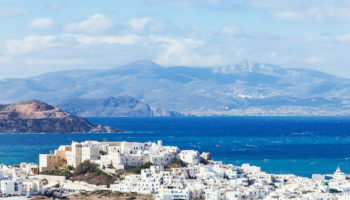 Officially named Thira, sunny Santorini is the largest and arguably the loveliest of the Cyclades group of islands located to the southeast of Greece’s mainland in the blue Aegean Sea. Santorini marks the spot of one of the largest volcanic eruptions in written history. The explosion created an archipelago out a single island and left behind the geological feature that attracts visitors to Santorini today: a giant sea-filled caldera. 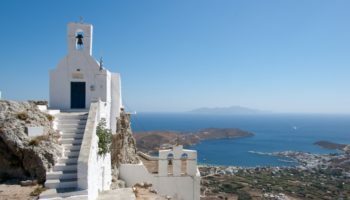 In addition to enjoying awe-inspiring views of the half-submerged volcanic crater, other things to do in Santorini include exploring Minoan artifacts and ruins buried by the ancient eruption. 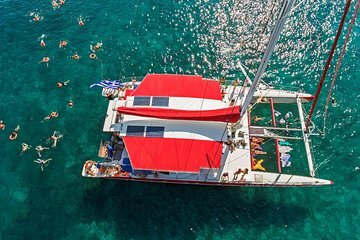 Famous for its dry white wines, picturesque beaches and vibrant nightlife, Santorini is a popular destination for visitors who just want to relax and unwind too. Situated on high cliffs jutting out into the sea between the beaches of Kamari and Perissa, Ancient Thera features ruins that were excavated in the early 1900s. 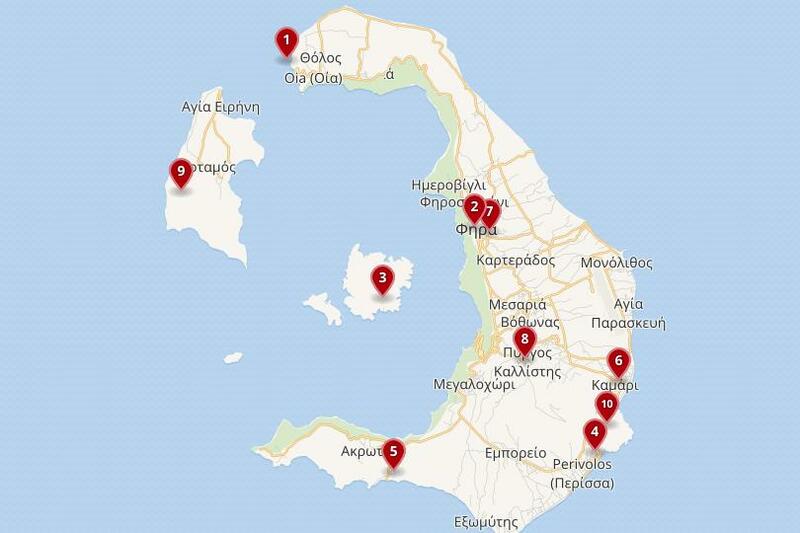 The ancient tombs, monuments and remnants of homes, churches and fortifications represent a broad range of post-Minoan periods. Standout features include Roman baths, 4th-century Hellenistic structures and a shrine to Apollo marked with 8th-century graffiti. Visitors can climb to the site from the beaches below or can reach the ruins by tour bus, taxi or private car. The island of Therasia makes an ideal destination for visitors who want to enjoy the sunny ambiance of Santorini, minus the crowds. The largest of the five small villages, also called Therasia, has only around 150 inhabitants. It’s reachable on the caldera side by a long flight of steps up the cliff. 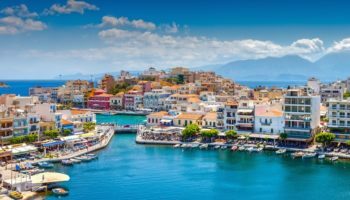 The smaller isle boasts the same picturesque architecture as Santorini, and the population shares the same traditions and customs. 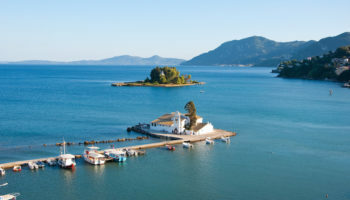 Whether enjoyed as a day trip or a weekend getaway, Therasia offers visitors an authentic Greek island experience. Once the capital of Santorini, the inland city of Pyrgos sits atop a hill that offers stunning views of the island from every direction. The remains of a Venetian castle perches on the hill’s summit. Within the castle walls is a church believed to have been constructed in the 10th century. Relatively unspoiled by tourism, Pyrgos features some of the finest examples of medieval architecture on the island. The village is surrounded by wineries, many of which offer tours and tastings. The dessert wine known as vinsanto produced here is considered one of Greece’s best. Located in the capital city of Fira, the Museum of Prehistoric Thera is one of Santorini’s most important cultural attractions. Opened in 2000, the museum features treasures unearthed at the Akrotiri dig, including an extensive collection of colorful frescoes. A depiction of women gathering saffron from crocus flowers offers insight into the daily lives of the island’s early inhabitants. While frescoes of swallows are easy to understand, as swallows still roost on the cliffs of the caldera, a depiction of blue monkeys has scholars baffled. Historians have found no evidence that monkeys ever lived on Santorini. The largest beach on Santorini and the most popular, Kamari is located along the seashore of the village of the same name. The town and beach get their name from the small arch or “kamara” wedged into the cliffs at the southern end of the beach, the remains of a shrine dedicated to Poseidon. Notable for its black sand and pebbled shoreline, Kamari is the most developed beach on the island, and the beach is lined with hotels, bars and nightclubs. Next to sunbathing and people watching, snorkeling and scuba diving are popular activities. Known as the “Minoan Pompeii”, the flourishing town of Akrotiri was at once destroyed and preserved around 1500 BC by a volcanic eruption. The town wasn’t discovered until the 1860s when workers collecting dirt for the construction of the Suez Canal stumbled upon the site. An outpost of Crete, Akrotiri was settled by Minoans as early as 3000 BC and reached its peak after 2000 BC, when it developed trade and agriculture and settled the present town. Some of the structures are three stories high with stone staircases and stores of large ceramic jars and pottery. Recently reopened to the public, Akrotiri offers visitors a unique glimpse of what life in Santorini was like during the Bronze Age. Perissa Beach is almost a mirror image of Kamari Beach, which is located on the northern side of the rocky headland separating the two stretches of black sand. 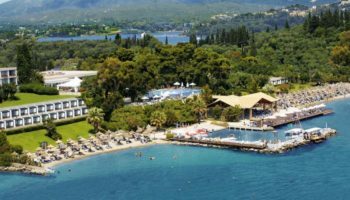 With fewer restaurants, bars and clubs, Perissa is slightly less developed than Kamari and a bit less crowded. The sand is of a finer grain too, which makes it preferable for long strolls on the beach. Water taxis are available that make it easy for travelers to visit both beaches. 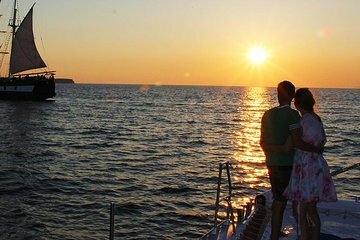 A dive center located in Perissa village offers snorkeling and scuba diving trips. 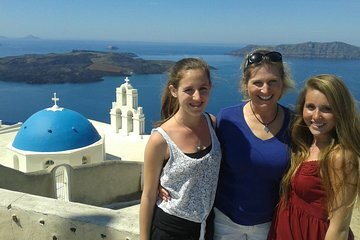 The Santorini volcano’s grand eruption occurred nearly 3,700 years ago, blowing the top off the original island. Sea water rushed into the caldera, forming a massive lagoon that’s so deep that all but the largest cruise ships can anchor in the harbor. There are two small volcanic islands at the center of the caldera, Nea Kameni and Palea Kameni (New & Old Kameni). Nea Kameni is a barren island, visited daily by dozens of tourist boats throughout the summer. Visitors climb a gravel path to reach the top of the 130-meter (430-foot) high volcanic crater, where it is possible to complete a full circuit of the rim. 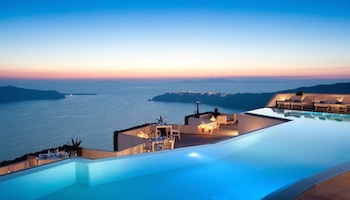 The capital of Santorini, Fira boasts one of the most spectacular locations of all the island’s towns and villages. 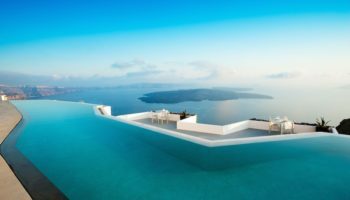 Perched along the edge of the sky-high caldera, the city’s white sugar-cube-shaped buildings offer incredible views of the shoreline and the Aegean Sea, especially at sunset when the entire town is bathed in golden light. 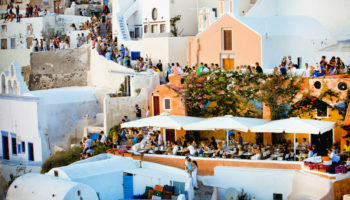 The central streets of Fira are filled with all kind of shops, jewelries, restaurants, cafes, bars and nightclubs and get very crowded in the high season. Visitors who arrive by sea can reach Fira by climbing the zigzagging staircase up the face of cliff. Less adventurous travelers can whiz to the top in a cable car. Famed for its stunning sunsets, Oia is a little bit less hectic than Fira and a top tourist attraction in Santorini. The village is also situated on top of an impressive cliff and features charming houses in narrow streets, blue domed churches, and sun-bathed verandas. One of the most beautiful villages on the island, Oia was once home to a prosperous merchant fleet that traded with countries on Mediterranean Sea during the 1800s and early 1900s. Although part of the city was destroyed by earthquake in 1956, remnants of its seafaring past endure. Elegant sea captain’s houses occupy the best part of town and offer the most impressive views of the caldera.